One botched keystroke sent Twitter into a frenzy last night. You know that sinking feeling in your stomach when you suddenly realize you've really f*cked up on the job? One can only imagine the type of trauma the late-night social media assistant at Yahoo Finance felt upon realizing that one of his or her tweets had gone viral -- for all the wrong reasons. Here's what was obviously the attempted headline for the tweet in question, which showed a picture of a large military vessel: "Trump wants a much bigger navy. Here's how much it'll cost." The tweeter got every character in the tweet correct save for the "B" in "bigger." On the standard U.S. keyboard, the "B" sits adjacent to the "N," which was the letter that was pressed in the faulty keystroke. And thus ensued one of the most infamous typos in Twitter history. The tweet stayed up on Yahoo Finance's page for at least 20 minutes, and in that time, accumulated thousands of retweets and hilarious replies. 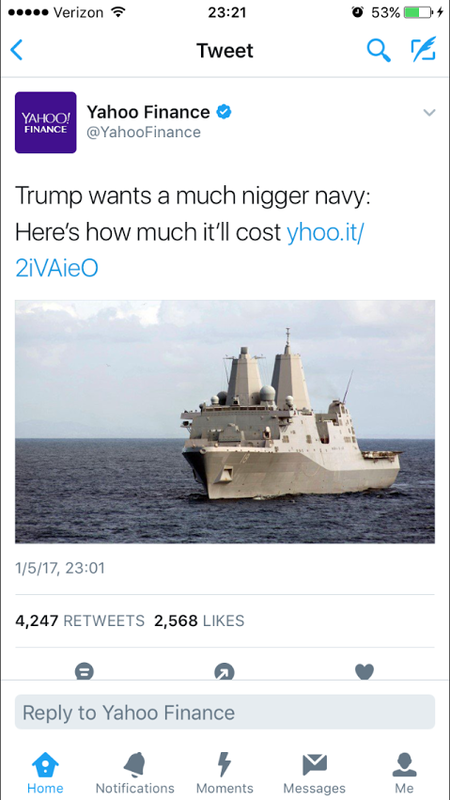 Shortly after deleting the disastrous tweet, Yahoo Finance tweeted a typo-free apology, admitting to the "spelling error." Ah, it looks like the spoils of Twitter shall continue into 2016. Bless.